After being ‘Elmered’ by Mark and Hank (WA2CCN), Lee (KC3LEE) quickly became addicted to all things Digital. He came up with the concept of a website to bring together the Hams that participated in the weekly check in and designed a quickie site, padmr.net, and with the gracious help from Corey (N3FE), one of the Brandmeister Guru’s, who redirected HIS domain (padmr.com) to the dot net address, thus giving people two address options…. Lee also started assisting with the Tuesday Night PA DMR Check-in Net as a Net Control Operator. The websites were all hosted and designed in WIX, right alongside a couple of other sites managed by KC3LEE, including his own Business Site. The annual cost for hosting on WIX was quite high, and the extensibility and customization was VERY limited, but convenient at the time. 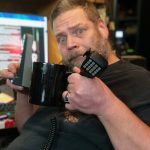 Lee has since decided to get back to his roots as a Systems/Network guy and go back to designing websites the PROFESSIONAL WAY… So, since the world of Digital Ham Radio has expanded so much over the last year, we all came up with the idea of going a step further with the Net and with the Website. Why not bring ALL the Digital Ham Modes together on one site? This is the result, or at least the start of just that. Lee moved the websites to his own host servers (which he has complete access to and has owned for years) and re-learned how to design from the ground up. In the future, we will be trying to bridge the BM31425 talkgroup to YSF, D*Star and other modes so that ALL the PA Hams can talk to each other and join in the weekly Check in Net, no matter what radio they owned! Online Classes on Radios, Tech, etc..
Based on WordPress, the most Versatile and Extensible PHP Content System. New Host Server with full Root Access and control of functionality. Geek Stuff. Topics about different Radios, Modes, Tech Issues, Codeplugs, just about anything as time goes on. ***NEW Codeplug section added to Forums! Suggestions? Post them in the Forum!